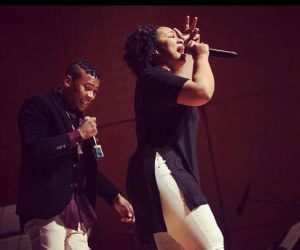 Essence Simmons: singing about life, Lord, ministry | Grand Central Magazine | Your Campus. Your Story. Waterford junior Essence Simmons is a person for whom singing is neither work nor a hobby, but a lifestyle. Simmons has been singing since early elementary school. One of the first songs she remembers singing is “Jesus Loves Me” during a solo recital in church when she was eight years old. Christ Central Choir travels as far as Ohio to perform at churches and colleges. They performed “Lift Every Voice and Sing,” commonly known as the African-American/Black national anthem, at CMU’s CommUnity Peace March & Vigil during Martin Luther King Jr. Day. Simmons’ favorite singers are Yebba Smith and Detroit gospel singer Kierra Sheard. A video posted to Facebook in September shows Simmons and two other Christ Central Choir singers singing “I Shall Wear A Crown” by Thomas Whitfield. At the time of writing, the video has 6,416 views. Simmons’ goal after graduating from CMU is to attend seminary school and sing in a music ministry, where she’ll be able to spread the word of God through song while applying her major in music and minor in leadership. Separator image Posted in Arts & Entertainment, Music, Music, Pop Culture and tagged with Arts & Entertainment, Christ Central Choir, Essence Simmons, gospel, Justin Cooper, Pop Culture.